Saving money is always a bonus when exploring a new place. Here&apos;s a week worth of frugal family fun in Overland Park. Deanna Rose Children&apos;s Farmstead is a wonderful local petting zoo that is free for guests of all ages Monday through Thursday. For $1 you can feed a bottle to the pygmy goats, which my kids love to do! Bring some quarters as well for a chance to feed the fish and chickens along with some of the bigger goats. You can rent fishing poles or ride a pony for $3. There is also an ice cream parlor to enjoy a tasty treat when you want to cool off. We enjoyed the chocolate ice cream because you really can’t go wrong with chocolate, am I right? 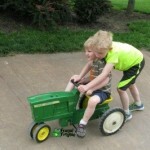 Here is a picture of my kids enjoying the push pedal tractors. Since my youngest can’t reach the pedals, I loved that my oldest son pushed him on the trackers. It was fun to watch them playing nicely with each other. 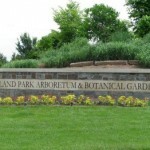 Did you know that on Tuesdays you can enter the Overland Park Arboretum & Botanical Gardens for free? Walking around the beautiful gardens and enjoying the nice weather was wonderful. My kids especially loved the train garden. 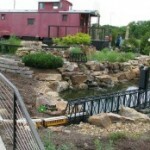 My youngest was climbing all over the caboose while my oldest was watching the trains circle around the train garden. We sat on the bridge and watched the fish and saw a few turtles as well. My youngest sat on my lap while he pointed out the fish and turtle to me, which made me so happy. I can&apos;t believe I have lived most of my life in Overland Park and have not visited the Overland Park Farmers&apos; Market in Downtown Overland Park before. There was a live band playing, and my kids loved dancing to the music. It was fantastic to watch my kids dance together to the music. We sampled many of the homemade food that the vendors sold. It was wonderful to see all of the fresh produce. I really had no idea how much great foods and products that were there for us to enjoy. We had a hard time not buying everything. 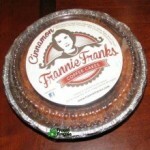 We purchased some delicious cinnamon coffee cake from Frannie Franks. 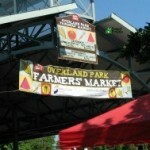 The Overland Park Farmers Market is open in the summer every Wednesday from 7am to 1pm and on Saturdays from 7:30am to 1pm. For the first Wednesday of July and August, there will be an evening farmers&apos; markets from 4pm to 7pm. Most vendors just stay the whole day so it really is a day of enjoying the farmers&apos; market – which is perfect because I am all about supporting a local business. This is the first summer that we are taking advantage of the Kids Summer Series. Enjoy 8 weeks of family friendly movies at B&B Theatres (formally Palazzo 16) for a low price of only $2 person. Every Tuesday and Thursday at 10am, B&B Theatres will run a family friendly movie. Last Thursday was the first time my kids had been in a movie theater. It was fun to see them watch a movie for the first time in a theater. During the movie, my youngest loudly called out mom but luckily since the theater was full of moms and young kids so it wasn’t too embarrassing. 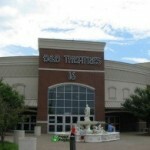 It has been a while since I had been in a movie theater as well so it was a nice change pace for us all. Now that we have gotten that new experience out of our system, we are looking forward to our movie this Thursday. Enjoying a local park is always free and it doesn&apos;t take a lot of time or effort to enjoy a park. 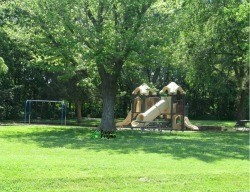 We enjoy the Thomas S. Stoll Memorial Park at 119th and Quivira. I like that it is shaded so we aren’t baking in the sun. You can play at the park for a short break between other activities. I love taking my kids to the park - it is fun to watch them play together. And if all five days for frugal family fun aren&apos;t enough for you, there’s more! Another free activity in Overland Park is the Third Fridays for Local Life. Enjoy music, food, and local businesses all at downtown Overland Park. Or, enjoy free music and a movie at Santa Fe Commons Park once a month. The next movie is “The NeverEnding Story” and will be July 11. Get more free fun ideas from this article. Beth Beseau is the owner of Frugal Froggie, which shares information with coupons, recipes, resources, and reviews to help families save money.